CC Bible Fellowship (Temecula CA) is currently serving in Baton Rouge, LA. Please pray for their team and those they will be ministering to. 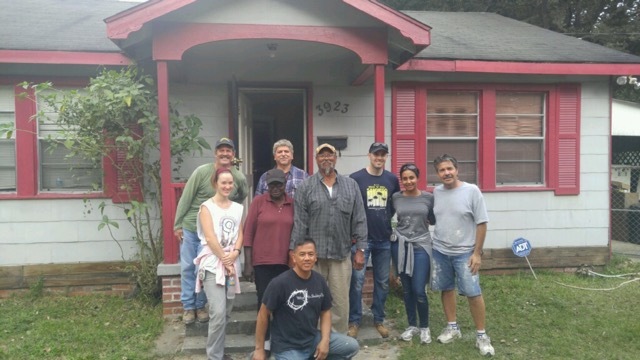 CC Chino Valley's Team is still serving in Baton Rouge. I spoke with Pastor Paul Hammontree the other day and he stated the needs are still unimaginable in Louisiana. His prayer was that the Lord would continue to put it upon the hearts of His Churches to send servants. If you haven't gone, please pray about going, if you have, pray about going again. CC Chino Valley's Team re-insulating a home after it had been "mucked" (All water damaged items and structures removed). A team from CC Chino Valley arrived in Baton Rouge this week. 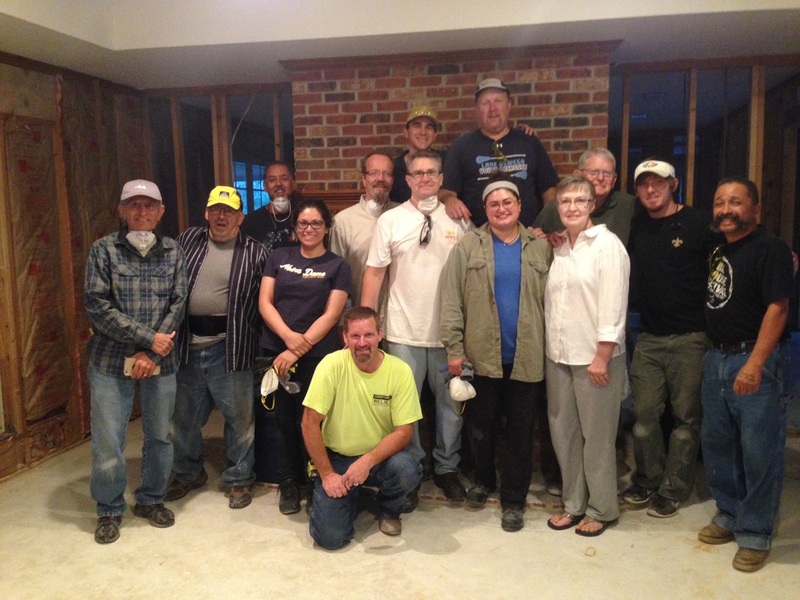 There first project was to insulate a home for a couple in their 80's. The home owners are the third and fourth from the right. A town called Denham Springs. Demo had been started, so we continued, pulling out drywall, Insulation, fiberglass tub/ shower units, etc., so it could dry out and be treated for mold before repair. Matthew, the owners son, was there with us. Throughout the day each of the teem members listened to his story and prayed with him, and as a team we lifted him and his family up to our Lord. About a year ago He had accepted Jesus into his heart. Matthews flood story; when the flooding started, Matthew went to pick up his mother from her Mobile home She just purchased it a month before and had no flood insurance because she planed to move it to her son's property. He pulled into the property and water started coming in his truck doors. Matthew and his brother thought they could Wade to the back of the property to get an old boat and just walk it to her steps on the trailer. The water was chest high, and quickly rose to neck high and swept them off there feet. They were being swept toward the bridge and he thought that he was going to die. His brother grabbed a vine and Matthew caught a tree by the road. The tree limbs formed a v about 7 feet up, and the water was up to Matthews chest as he stood in the v. Somehow they got to the road, and there HAPPENED to be a truck pulling a jet ski passing by the property. They unloaded the jet ski and road it up to the top of the porch (7 steps up) and rescued his mom. The home got 10" of water inside. We were grateful to be able to serve at an out reach at the Red Cross/FEMA center. In addition to serving dinners to many who had been at the center since the beginning of the flooding, we also asked if we could go inside to pray for people. We were told no, we could not, but one of the Red Cross workers, an elderly woman on fire for the Lord and full of the Holy Spirit said that she would bring them out to us, and that's just what she did. There was a time of worship and a pastor from our church proclaimed the Gospel. Souls were saved, and many were lifted up to our Lord. Many people who were doing well before the flood have started putting there lives back together, but the poor, the elderly, and those with other issues will have a struggle to come back. They have no home, no car, no job, and no hope, if their hope is in their earthly Possessions. I pray that Christ is there hope. We lifted many to the Lord praying for his intervention, For his miraculous touch on their lives. There were hundreds in the center that need our continued prayers. 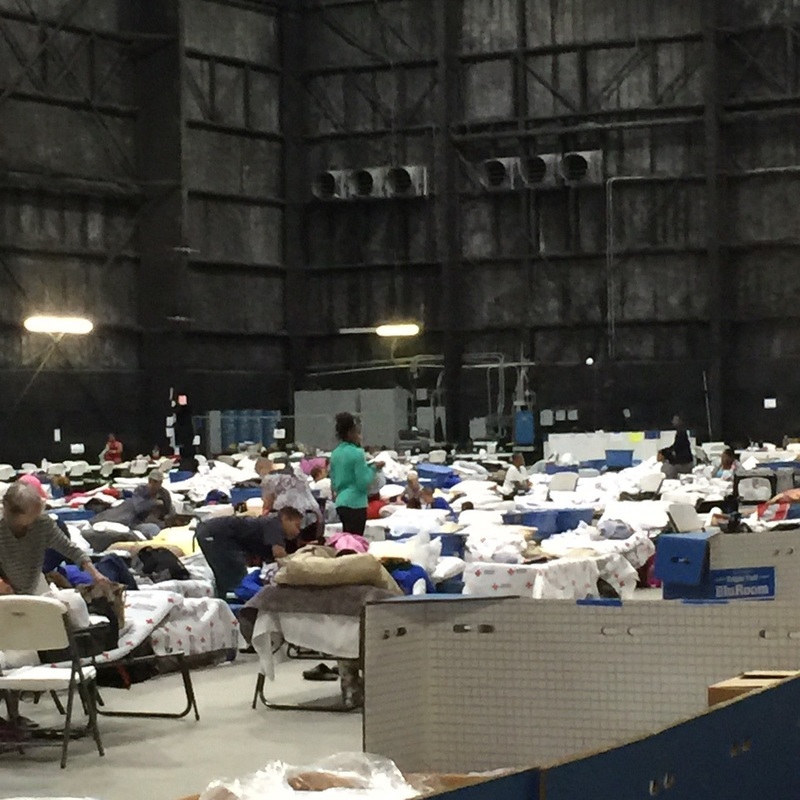 This particular Red Cross/ FEMA Center was scheduled to close on Wednesday, October 5. Most people that I prayed with did not know where they would go. As we await reports of damage and needs from our churches on the East Coast, more information is coming in on the impact of Hurricane Matthew on Haiti. 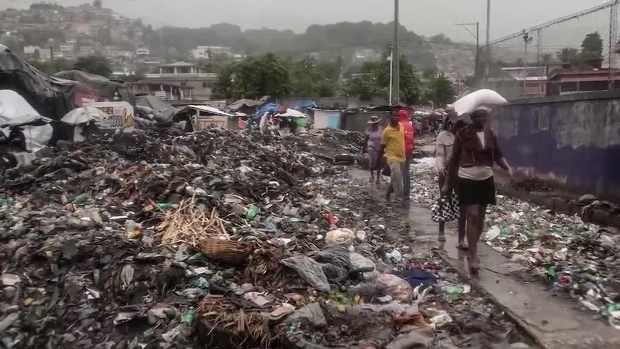 The Government is reporting over 900 dead with tens of thousands of home damaged and 350,000 people in need of aid. Gary La Blanc of Mercy Chefs has sent water filtrations systems to Haiti, and is moving resources into the eastern United States.